It’s been a few weeks since we checked in with our newest trainee of the Fox Plumbing & Heating team, Matt D. He’s been with us for almost three months now. We sat down with him to get an update on his progress with our team and see what he has learned so far. 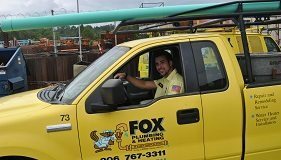 “I can say that here at Fox Plumbing & Heating it’s definitely not redundant nor boring, every day is a new challenge.” – Matt D.
Matt has been attending all of the training and team meetings that Fox offers weekly. He believes that the feedback has been very helpful and insightful as he begins to prepare for his Residential and then Journeyman’s license. To become a Plumbing Professional it takes at least 4 years of training to obtain the necessary amount of hours to apply for their Journeyman’s license. According to Washington guidelines, you must have 8,000 hours of training before you can qualify for a residential license. The average amount of hours a year that you can register is around 2,000. And a Journeyman’s license requires a total of 6,000 hours. 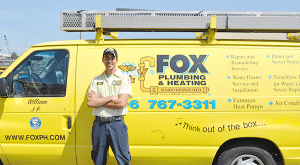 That is part of the reason why Fox Plumbing & Heating puts such a strong emphasis on having professionals, and why our level of service is so outstanding. We believe that our primary focus is to create an award winning customer relationship. Matt has seen that first hand and said that it really begins from the top down here. “The importance that Dave, our president, puts on long-term relationships is always promoted during our meetings. He’s a nice and smart guy, and I think it’s great how he really lives by the mission to create lifelong relationships,” Matt said. David Brown has been servicing Seattle and King County for over 40 years. Because of that commitment and dedication, every employee strives to provide an excellent level of service and treat people as much more than just a customer. Matt seems to be really excited for his future, and Fox Plumbing & Heating is really happy to have added another exceptional member to our family. We’ll be checking-in with him in another few weeks to see how he is progressing. Plumbing is a lot harder work than I originally thought. I'm not a plumber, but I tried to fix a few plumbing issues I had in my house. It really wore me out. I know exactly what you're talking about with the stamina plumbing requires. And you guys do it all day every day!